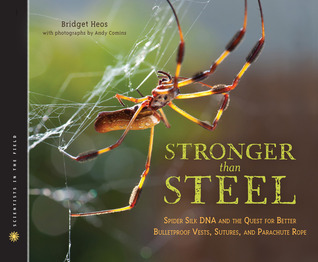 Stronger Than Steel: Spider Silk DNA and the Quest for Better Bulletproof Vests, Sutures, and Parachute Rope by Bridget Heos. Grades 6 and up. Houghton Mifflin Books for Children, 2013. 80 pages. Review copy provided by my local library. It turns out that spider silk is amazing stuff and the golden orb weaver spiders make a ton of it. It's super strong and flexible and it might make a better material for lots of stuff we use all the time. The problem is that it's impossible to farm golden orb weaves (like we farm silkworms, for instance)... they eat each other! So scientists have been hard at work figuring out a way to produce spider silk. One possible answer? Inserting spider DNA into other animals or plants so that they begin to produce the same proteins that the spiders produce. Have you ever seen a spider-goat? Well, pick up this book and you will! This book is definitely more than meets the eye. I guess I'm not sure what I was expecting, but spider-goats was not it! That said, it's an interesting look at something I really knew nothing about. This may be one for your die-hard science fans, but I think passages could easily be used in science classrooms to meet new Common Core standards. The book begins with a basic explanation of DNA and then examines three studies scientists are working on to see how they can best produce spider silk. Scientists have inserted DNA from golden orb weavers into goats (who produce the protein in their milk), alfalfa, and silkworms. A brief section on the ethics of biological engineering is included at the end, an important addition since this is definitely a controversial topic. This book (or passages from it) might lead to some great classroom debates on the topic. Back matter is excellent, which we've all come to expect from a Scientists in the Field book. For more in-depth looks at intriguing science topics, definitely check out more of the Scientists in the Field series. As far as topical readalikes, I'm stumped since this book was very unique! Any suggestions? Happy Nonfiction Monday! Head over to proseandkahn for this week's roundup!